Canada is clearly related to the US. You'll love this. A dead raccoon was found on a street corner in Toronto. The proper authorities were contacted about removing it, but they never showed up. 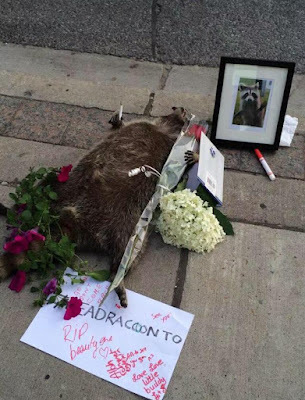 So people did the only logical thing: They constructed a memorial around it, complete with a photo. Isn't this great? It's this wonderful, offbeat, completely inappropriate sense of humor we have. I remember right after the OJ freeway chase, when a local car company had a contest. First prize was a white Ford Bronco with AC in the front and OJ in the back. Yes, it's a little bit on the sick side. That's what makes it so good. We have this ability to not take ourselves too seriously. Even most things that are deadly serious have a little corner to them that's funny. We seem to be good at finding that. Growing up on MAD Magazine probably didn't hurt. Thank you for understanding and appreciating my sick, warped sense of humor, the kind that only critical care nurses have. You never tried to rein it in, never even attempted to have me institutionalized. You knew full well what you were getting into before marriage. After all, you were the only non-nursing-student that would eat with us when we came to the dining hall straight from clinical. So, of course, I threw a net over you. Thank you for being caught. Tonight, know that, even with all the distressing things going on, we have not lost our sense of humor. And it's still a bit sick. That is good.